Keychains have never mattered -- until now. A LEGO minifig keychain w/ LED lights in the feet? Who's not on board with that one? LEDs have helped drive a customization boom in minifigs the past several years, creating a line of new collectibles. There were the Halloween minifigures, including light-up ghosts and a Jack-o-Lanterned head straight out of Sleepy Hollow. The storm troopers with glowing red eye holes in their helmets. And LEGO Ironman, with a glowing LED power source in the chest and rocket feet. 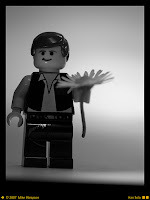 It remains the sweetest minifigure I've ever seen. The keychain will apparently be available in mid-September. Gentleman, get a belt clip for your phone and clear some room in your pockets -- it's time to up your cool factor.